Helping others is a hallmark of the Samford University community, deeply rooted in the university’s historic Christian mission. For the 14th consecutive year, Samford students, employees, alumni and friends came together to support a special project with Habitat for Humanity of Greater Birmingham. A collaboration between Habitat and Birmingham’s ABC television affiliate, “Home for the Holidays” involves 20 corporate sponsors who build houses for two deserving families in 10 days as a Christmas gift. Samford is the only corporate sponsor to have participated all 14 years. Forty volunteers participated in the Samford build day on Dec. 2. Samford’s participation was coordinated by the Mann Center for Ethics and Leadership and the Division of Marketing and Communication. 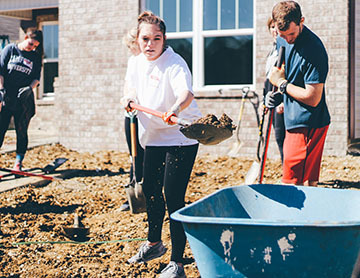 Daphne Schmid, a junior health sciences major from Tampa, Florida, has coordinated Samford student involvement with Habitat for Humanity throughout the fall semester. The morning work session volunteers included 18 students from a semester-long service cadre. Earlier in the semester, the students had worked on other Habitat projects, with “Home for the Holidays” culminating their experience. Samford volunteers caulked walls, did siding and cleaned up debris. Hailey Keehan, a sophomore from Mount Juliet, Tennessee, said the caulking was “hard work, but it was worth it,” knowing that a family would benefit from her efforts. “Everyone usually hates this job (caulking), but my thought is that it needs to be done so why not do it,” Keehan added. The Samford volunteers worked along with new homeowner Ashely Harris and some of her family members. Harris works at Children’s of Alabama and has a one-year-old daughter, Brooklyn. She is a member of West End Hills Missionary Baptist Church in Birmingham. The two houses will be dedicated Dec. 14 and then turned over to the new homeowners.